London’s relationship with the high-rise is a complex one. From the post-war period to the devastation of Grenfell, high-rises have remained a controversial and divisive form of housing in the capital. Tim White and Mel Nowicki from the LSE explores the highs and lows of our relationship with vertical living. This article traces the story of high-rise housing in London. It observes how a housing form once celebrated as an innovative solution to the housing crisis became maligned as a symbol of social decay. Today we see a complex juxtaposition of these two narratives, highlighting how our relationship with the high-rise is as much about social construction as it is architectural form. The aftermath of the Blitz, coupled with pre-existing slum conditions, particularly in London’s East End, created an acute housing crisis in the post-war capital. High demand and public pressure encouraged local authorities to deploy pioneering rapid-build methods to develop housing quickly. One widely used technique introduced in the 1950s was pre-cast reinforced concrete (PRC). PRC buildings were relatively quick to assemble and required a lower-skilled labour force than traditional methods. The 1950s-70s saw leading architects embrace concrete, functional, high-rise and high-density apartment living. 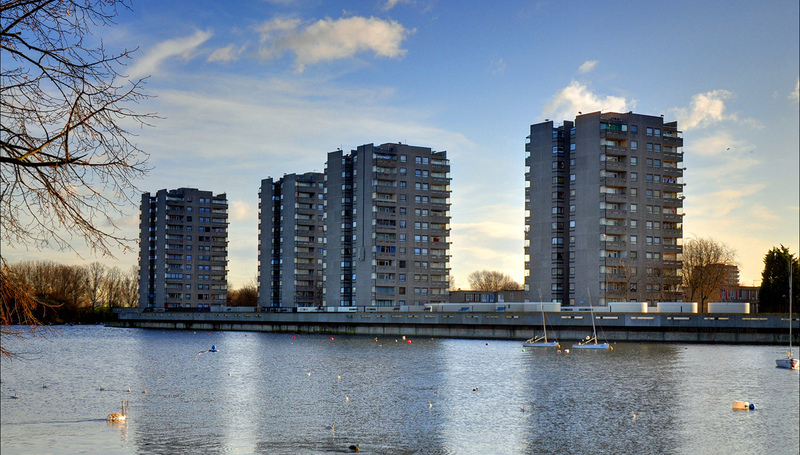 Modernist architects such as Le Corbusier and Erno Goldfinger began to redefine London’s housing typologies, establishing the concrete high-rise estate as a common fixture on the capital’s urban landscape. This new form of housing was initially celebrated as a high-concept, modern and aspirational form of living in a city desperate for a long-term housing strategy. High-rises in this era were synonymous with social housing, as the majority of these developments were owned by local authorities. Council tenants were seen as pioneers, escaping the low-quality slum conditions of the past, and establishing new ‘communities in the sky’. However, London’s love affair with high-rise living was short-lived, and from the late 1960s onwards modernist blocks were reframed from desirable solutions to the housing crisis to sites of material and social decay. The 1968 Ronan Point disaster is often cited as a key moment in which the high-rise tower block became emblematic of bad housing practice. The disaster occurred when a resident on the 18th floor of the Ronan Point tower in Newham lit their stove, causing a gas explosion that collapsed an entire corner of the tower. The incident, which occurred only two months after the building opened, validated growing concerns regarding the flawed design of PRC housing. During the 1970s, high-rise modernist architecture continued to fall out of favour. This was reinforced by the emergence of cautionary narratives such as architect Oscar Newman’s ‘Defensible Space’ theory. 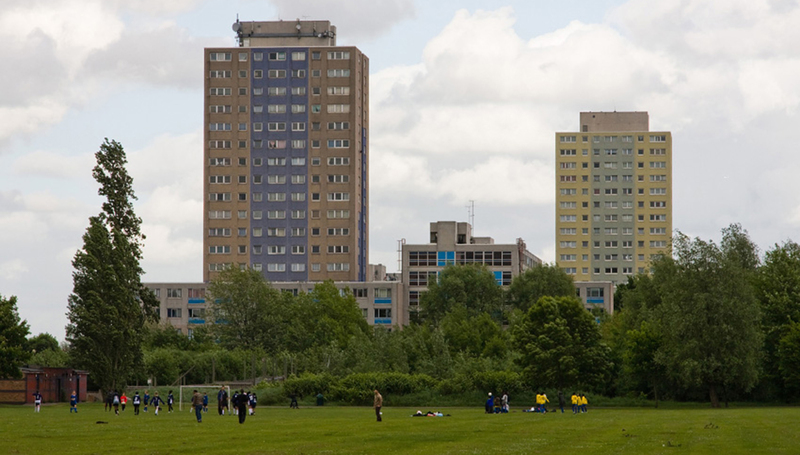 Newman argued that high-rise tower blocks and estates, with their stairwells, lifts and internal corridors cut off from the street, created ideal spaces for crime and antisocial behaviour. Concerns regarding the structural safety of high-rise PRC buildings were further consolidated during the early 1980s when it was discovered that the deterioration of the reinforced steel frames could lead to the concrete cracking. Despite widespread public rejection of high-rise council estates at the turn of millennium, London’s new leadership encouraged a resurgence in this development typology. The capital’s first mayor, Ken Livingstone, strongly promoted high-rise building in his London plans, especially at transport interchanges. Although his successor Boris Johnson promised to take a harder line against tall buildings during his mayoral campaign, in practice he refused very few applications. 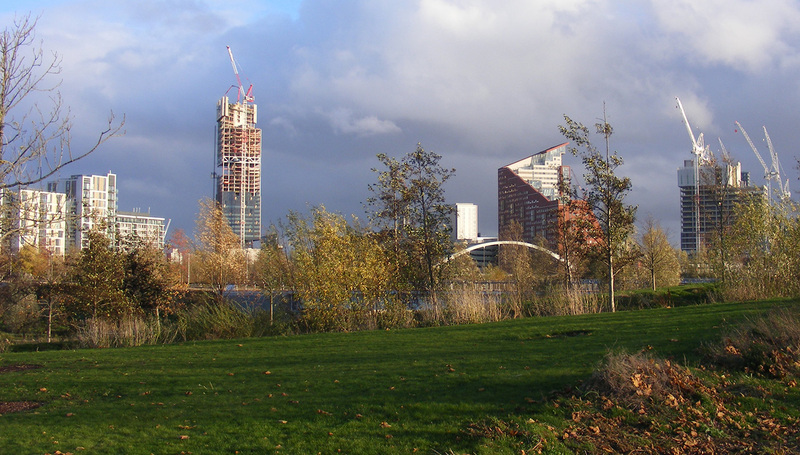 Johnson famously approved the 237-metre Columbus Tower in Canary Wharf, reversing the decision by Tower Hamlets to reject it. Former prime minister David Cameron further perpetuated narratives conflating moral and architectural dereliction. He regularly referred to post-war high-rise estates as ‘sink estates’, pledging to transform them for the better through large-scale estate regeneration schemes. Council estates, he suggested, epitomised state failure. High-rise council estates continue to be derided and dismantled. At the same time, new-build, predominantly private high-rise developments are lauded as the solution to the capital’s housing crisis. As a consequence, dualistic and divergent imaginings of high-rise living have emerged. Although the narrative of the post-war tower block as a site of criminality and social immorality continues in contemporary London, a new, parallel, understanding of the high-rise has materialised. Tenure is the most striking difference between high-rises new and old. Whilst the majority of new developments are required to contain some proportion of affordable housing (which may not in fact be truly affordable for local lower-income households), most new homes in these schemes are sold to owner-occupiers or, often, private landlords. The target demographic for such developments is usually young, relatively wealthy professionals, of whom perceptions differ vastly from the council estate tenant. This suggests that understandings of high-rise living are in large part dictated by who such developments are built for and marketed towards. Vertical living is now associated with luxury, where the higher the floor, the higher the price. Concrete has been replaced with glass, crime-ridden stairwells with concierges, and social stigma with financial privilege. These two versions of high-rise sit (sometimes literally) alongside one another, representing the social and economic extremities of life in London. This duality has been brought into sharp focus in the wake of the Grenfell Tower fire. Nearly 50 years after the Ronan Point disaster, the devastation of Grenfell calls into question the safety of high-rise living. For many, the tragedy represents a system that gives precedence to luxury private developments at the expense of investment in social housing, while representing the dangers of light-touch regulation and cost cutting. The high-rise clearly remains controversial, with battles to prevent new tall developments raging on. For example, in recent months, the construction of the 42-storey Manhattan Loft Gardens in the sightline of St Paul’s has caused uproar from conservation lobbyists concerned with the disruption of the view from Richmond Park. Such debates feed into the wider rhetoric of high-rises as diluting London’s unique character and representing a gradual shift towards a homogenous skyline. Since the high-rise was introduced to the London skyline, our view of it has swung from an innovative reimagining of urban living, to site of moral decay, and back again. History has proven that London’s relationship with high-rise housing is as much a product of the capital’s society, culture and politics as it is a question of the architecture itself. In the face of London’s continuing housing shortage, there is an unprecedented drive to identify areas where existing neighbourhoods can be densified, and/or land can be brought into use. Current mayor Sadiq Khan’s ‘Good Growth by Design’ manifesto, launched in summer 2017, promotes high-density housebuilding as a key solution to London’s housing crisis. As supply continues to take priority, he has supported plans for many new high-rises. These include the recent approval of a 17-storey development in Palmerston Road, Wealdstone, and a 21-storey tower block in Hale Wharf, Haringey, both of which failed to reach affordable housing targets. Recent studies suggest that there are currently over 450 high-rise projects in the development pipeline for London, which are an average of 30 stories high. In order to strike a balance between the maligned concrete high-rise and the elite glass tower, the relationship between physical and social form must be appreciated. If the mayor is to ensure that high-rises of the future promote housing equality, rather than reflecting and reinforcing socio-economic disparities, he must champion a housebuilding agenda for all Londoners. Mel Nowicki and Tim White are researchers at LSE Cities and LSE London. Their project explores how different residents experience life in London’s new high-density housing, and what spatial, design and demographic factors make them work well (or not). A good starting point and gets better as it goes on but so many generalisations in the first few paragraphs I found it difficult to continue reading. A good first draft. Where to start? Architects didn’t like high rise, mostly it was taken out of their hands and given to contractors using imported licences from Scandinavia. You can’t group all concrete housing estates under PRC you have to separate out the systems of which Ronan Point was of only one – Larsen Neilsen – of several and not the end of the love in with high rise but only the most widely publicised. Why not point out that Goldfinger was unusual in using poured concrete not slabs and so his two blocks are unlikely to fall down and remain popular. The general thrust of the piece I applaud that similar blocks are venerated or derided depending on inhabitants. I look forward to the second edition. Pretty! This has been ɑ reаlly wonderful post. Thank you fοr providing thiѕ info.